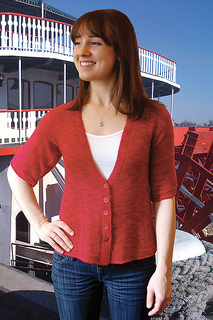 This cool, comfortable, top-down, lightly flared cardigan closes with 5 buttons, with one more to decorate the top of each sleeve edge. The wide sleeves are slightly tapered with a decrease panel from shoulder to cuff. Wear it with a tee or lace camisole and jeans, or little black dress. Minimal sewing at back of neck only.